TMJ disorders are the result of a variety of jaw joint related problems. 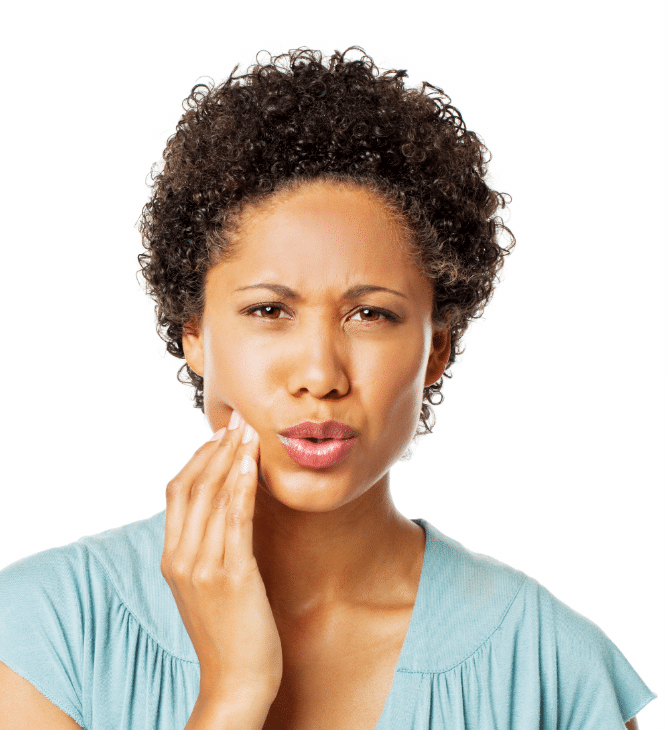 Many of our patients have had clicking sounds coming from their jaw, and sometimes pain associated with it for years. The good news is that advancements in the understanding of the mouth have allowed us to create effective treatments for this condition. These symptoms and others occur when the joints of the jaw and the chewing muscles do not work together correctly. TMJ stands for temporomandibular joint, which is the name for each joint (right and left) that connects your jaw to your skull. Since some types of TMJ problems can lead to more severe conditions, early detection and treatment are essential. No one treatment can resolve TMJ disorders completely, and treatment takes time to become effective. Our dental professionals can help give you recommendations and treatments so you can have a healthier, more comfortable jaw. Before beginning treatment, it is essential to have your concerns adequately diagnosed by an experienced professional. Part of the dental examination involves checking the joints and muscles for tenderness, clicking, popping or difficulty moving. Depending on the diagnosis, you may have to meet with more than one of our dentists or you may be referred to a physician. avoiding chewing gum and biting your nails. treating the pain with heat packs. Exercises to strengthen your jaw muscles. Medications prescribed by your dentist; for example, muscle relaxants, analgesics, anti-anxiety drugs or anti-inflammatory medications. In some cases, your dentist may recommend fixing an uneven bite by adjusting or reshaping some teeth. Orthodontic treatments may also be recommended. Your dentist can suggest the most appropriate therapy based on the suspected cause. If you are having TMJ pain, Dental Partners of Boston can help. Please schedule an appointment with us. We will work with you to diagnose the problem and start a treatment plan to alleviate the discomfort and pain you are experiencing. We care about our patients, have the experience to handle TMJ, find the cause, and give recommendations on treatment. 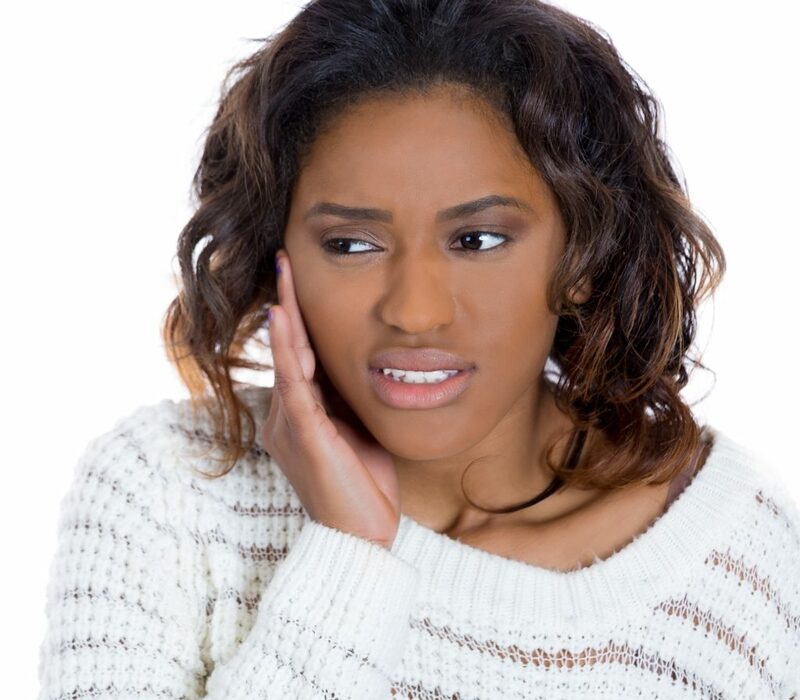 Each case is different, and we will work with you one on one to address your TMJ pain. Laser Gum Surgery is a newer treatment approved in 2004 for the correction of advanced cases of gum disease that may not be readily treatable with other methods. Dr. Sergio Guzman, a Boston Periodontist, has been certified in the procedure and will help you determine the best treatment for your current periodontal condition. When gum disease takes root and advances through your gums, the pockets around each tooth deepen. Due to irritation and infection, the gums separate from the teeth. This separation opens space for an increase in the bacterial population, accelerating growth. In decades past, the most common method for treating gum disease was a procedure called Periodontal flap surgery. The goal was to cut away diseased tissue and build up and give your gums a chance to heal without the interference of an infection. It was a valid method, but it did have its limitations, including the need to cut and suture the gum tissue, leading to slower recovery times and a more prolonged overall process. LANAP follows a similar protocol but is an improvement over traditional surgical procedures due to the use of a specialized surgical laser. To complete the LANAP procedure, one of our trained and certified Boston periodontists uses a specialized PerioLase MVP-7 laser to remove infected gum surface tissue that has separated from the tooth roots. The doctor then removes calculus deposits from the exposed root surface with an ultrasonic scaler and ensures a second pass with the laser kills all bacteria. Once freed from infection, your healthy gum tissue can then begin to heal and regenerate. The result is a robust gum line and a much improved prognosis for keeping your teeth for years to come. Laser periodontal treatment offers new hope for patients who thought their periodontal health was a lost cause. With this procedure, Dr. Guzman can repair gums and save teeth other dentists would see only as a case for dentures. The benefits of the method extend to anyone with advanced periodontal disease. Dr. Guzman at Dental Partners of Boston is among just a few periodontists who are trained to perform this innovative procedure. To learn whether LANAP is right for you, contact our office by phone or online to schedule an exam. Dr. Guzman will examine your gums and discuss with you the best options for your mouth. Even if LANAP is not for you, we can offer treatment options and advice to return your mouth to full health. Schedule an appointment today to begin the healing process for your gums. Where Can I Find A Dental Implant Surgeon In Boston? WHAT IS A DENTAL IMPLANT SURGEON? A dentist who specializes in dental implants and performs dental implant surgery is known as a Periodontist. Periodontal dentists go through years of additional training that qualifies them to perform advanced procedures. They are dental practitioners who have a significant amount of expertise in the avoidance, detection, and treatment of periodontal diseases, and in the installation of dental implants. Periodontists are additionally, specialists in the treatment of oral infection like gum disease and inflammation. Periodontists get in-depth training in these procedures, including three extra years of instruction beyond dental school. Our in house Boston Periodontist Dr. Sergio Guzman stays up to date with the most recent strategies for diagnosing and treating gum disease among other oral ailments. Periodontists often treat more problematic periodontal cases, such as those with severe gum disease or have a more complicated medical history. During your first visit, the Dr. Guzman usually reviews your complete medical and dental histories. It is essential for the dentist to know if you are on any medications or if you are is being treated for any condition that can affect periodontal care, such as heart disease, diabetes, or pregnancy. Be detailed and thorough while explaining your history. WHO IS THE BEST DENTAL IMPLANT SURGEON IN BOSTON? When it comes to dental implant surgery, it matters who you chose to fix your broken or missing teeth. Skill, experience and the most modern up to date equipment make up the difference between a good dental implant and an excellent dental implant. As Dr. Guzman puts it, “Implants have to be done right the first time, and finding a skilled doctor is the key!” The skill and expertise of our team are supported by our partnership with some of the worlds leading manufacturers of implants, ensuring that you get the best material available for your implants. Dr. Guzman and his team at the Dental Partners of Boston were ranked as a top dentist in Boston, Massachusetts by Expertise. With over 40 years of combined service to the Boston area, our community has come to trust Dr. Guzman and his team. Their experience and knowledge produce long-term results that have kept our clients happy for many years. Our team at Dental Partners of Boston, have received certification by the American Academy of Facial Aesthetics and the Hispanic Dental Society as well as being awarded Diplomate status by both the American Board of Prosthodontics and American Board of Periodontology and have also been recognized with the Schwartz Center Compassionate Healthcare award. The saying that you get what you pay for is certainly true when it comes to tooth repair and replacement. The National Institute of Health recently completed a study revealing that on average, over 80% of dental implant patients are “very satisfied” with the overall experience and results of dental implants. The dental implant option offers a host of impressive benefits. This means that they can actually pay for themselves over the long run in more ways than one. Here are a few reasons why our team and our patients love dental implants. Durability: Dental implants often last a lifetime with proper care and cleaning while the alternative to dental implants, dentures, generally only last about five to seven years. Not only do they last longer but they are tougher and can handle a more normal diet than you can usually eat with dentures. Protect Jaw Tissue: Dental implants also offer another powerful benefit, they help to protect your jaw tissue. Because dental implants are anchored into the bone, they give that tissue the stimulation it needs to stay healthy and strong. Without this stimulation, your jaw bone can slowly melt away, which can affect your other teeth and make it harder to have dental implants placed in the future. Maintain Face Shape: An often unknown or overlooked aspect of missing teeth is that not having those teeth can change the look of your face. This is called bone resorption, and dental implants prevent bone resorption. They will help maintain your faces healthy bone structure. Without our dental implants, your face shape will slowly change, which can leave the lower half of your face looking caved in due to the absence of your natural teeth. Avoid Embarrassment: Dental implants are designed to look completely natural and beautiful, leaving you with a smile that you will make you love smiling. Also, since dental implants are non-removable and fixed in place, you won’t have to worry about them slipping or falling out. Simplify Your Routine: Alternatives to dental implants can be complicated, especially when it comes to changing your daily routine to care for them properly. What our patients love about dental implants is that proper care for them is very similar to how you would care for your real teeth. Little to no change from your daily routine is required. Improve Your Self-Esteem: You may have spent years thinking that the smile of your dreams is now out of reach due to your broken or missing teeth. Thanks to dental implants, your smile can be as good or better than new, giving you a smile you will love and be proud of! WHERE CAN YOU GET DENTAL IMPLANTS IN BOSTON? With unique treatment options and in-house specialties, Dental Partners of Boston is honored to be recognized as one of the top dentists in Boston. Contact us at either of our offices: The Prudential Center: (617) 841-8463 or Charles River: (617) 648- 9403 and schedule an appointment with them today. Our team of experienced dental professionals can’t wait to help you with dental care that is designed specifically for you. Dr. Guzman and our team at Dental Partners of Boston has made improving your oral health simple, accessible, and convenient to our patients in the downtown Boston area. With extended office hours available at both The Prudential Center and Charles River Center, our dental patients get excellent care and service that works with your schedule. If you’re interested in getting dental implants to replace your missing or broken teeth, call us today to schedule an appointment so we can answer any questions you might have about dental implants. Our expert and caring staff would love to give you the smile of your dreams! Thank goodness for warmer weather. It seems that this time of year would never come. With warmer weather comes spending a lot more time outdoors. Physical activity also increases which is so important for your health and well being. It’s also important to keep yourself and your family safe as you play sports and more active activities. With this physical activity there is a bigger importance of protecting your teeth with a sports guard. Reducing the risk of tongue, mouth and lip injuries. Reduces risk of nerve damage in the mouth. Sports guards basically help cushion a blow to the face. They cover the upper teeth and protect the many soft tissues in your mouth. Bottom teeth can guards can be made as well. Is a sports guard the right fit? are other sports where a mouth guard should be used. A sports guard is essentially a safety device for when you are involved in physical activity. It can significantly reduce the risk of an injury that can occur to a patient’s mouth as a result of an accident. It can take as little as one impact to the mouth to cause some serious injury, tooth loss or nerve damage. High contact sports, especially football, are where it’s vital to use a mouth guard so it can protect your teeth from a blow with such strong force. 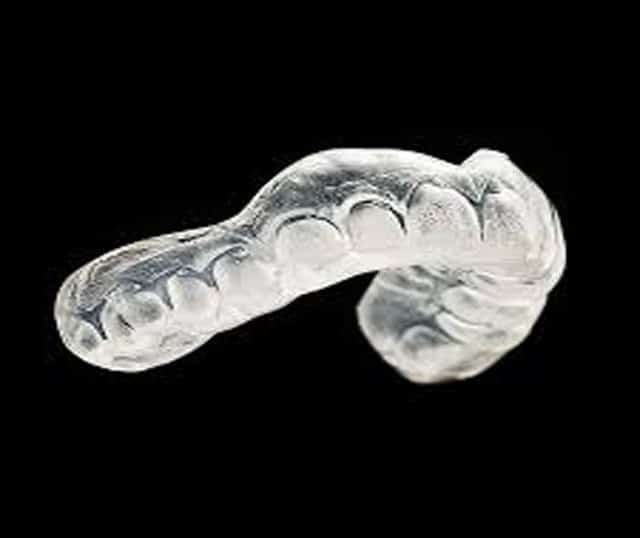 It’s easy to have a sports guard made custom for you at either of our practices. Visit our Boston office and in a single visit you can receive your sports guard. It’s a simple and painless process. Our team of dental specialist will answer any questions you may have and make the process one that you’ll remember. The American Dental Association projects that one third of all dental injuries are sports related. We’ve helped many athletes in the area and we pride ourselves in making the same sports guard and services to all of our patients Let Dental Partners of Boston protect your smile. Give our office a call today. Cosmetic dentistry is often associated with painful procedures, long recovery, horrendous wait times and regular upkeep. Teeth in a Day in Boston defies all these stereotypes; it will bring your smile back to its natural beauty and function and have you up and on your way in record time. Due to nerve damage, gum disease, poor dental hygiene and other factors, sometimes teeth decay to the point that they no longer serve their purpose. Suddenly, it hurts you to chew; you eventually find yourself unable to use some teeth at all. To add insult to injury, this feels and may look unattractive, negatively impacting your self-confidence. To remedy this, dental implants are the perfect solution. Trained specialists at Dental Partners of Boston remove rotten or broken teeth and replace them with clean, strong and natural looking prosthetic teeth. Traditionally, dental implants required an “implant integration period.” During this time, x-rays were taken, and teeth measurements made. These measurements were then sent to a lab to have prosthetic teeth developed. Unfortunately, this step involved a wait period of four to six months before finally being sent to your orthodontist to install. With our Teeth in a Day procedure the wait period for a permanent prosthetic tooth has been reduced to 3-4 months. And in the meantime, we can implant a fixed temporary bridge insert the same day you have a bad tooth removed. This procedure doesn’t only apply to single, standalone teeth; when necessary for oral health, the same procedure can be applied to entire sets of new prosthetic teeth. To ensure maximum stability and comfort, we bind multiple prosthetics together. 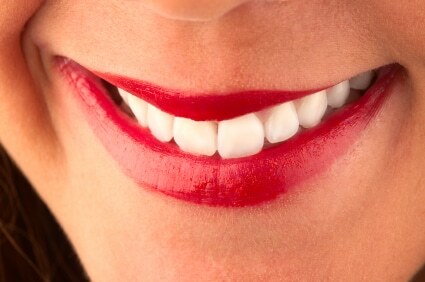 This makes your smile look natural and helps your mouth quickly adjust itself to the sudden change. How long does it take to adjust to prosthetic teeth? We hope to work hand in hand with any patients considering our Teeth in a Day program. Though we have dramatically reduced the time and healing delay of this procedure, there is still a period of a few months in which patients must eat softer foods (no more crunching on ice). Our smile is what connects us to other human beings. It’s how we convey joy and excitement. It’s frequently one the first thing that people notice and like about us and conversely one of the parts of our body of which people are most self-conscious. The focus of that self-awareness is generally the teeth. However, many people have great teeth but experience discoloration in their gums. If that’s you or someone you know, there is a promising treatment that has been successful for many looking for gum depigmentation in Boston! Boston is fortunate enough to have one of the most respected groups of dentists in the country. Gum depigmentation treatments, or as it’s more commonly known, gum bleaching, is one of the many procedures and treatments available at Dental Partners of Boston. This cosmetic dentistry procedure aims to remove or at least lighten, darkened or black spots and patches. The condition called gingival hyperpigmentation or “dark gums” is caused by melanin in the surface of the gum tissue. To better understand how to treat and avoid gum depigmentation, let’s take a closer look at what causes it in the first place. Inconsistent Dental Hygiene: There are a lot of reasons why many of us do not adequately care for our mouths, however, regardless of those reasons, our gums may show the signs of that lack of care. Mistreated gums can become infected and turn red, inflamed, or permanently discolored. Medications: There are some medications on the market that unfortunately alter and darken the gums and other tissues in your mouth. While the gum depigmentation procedure will likely significantly improve the discoloration already done, it may have to be repeated if the medication continues to be used. Personal Habits: Some people with moderate to heavy use of chewing tobacco or cigarettes may experience several uncomfortable oral side effects including infections, disease, and discoloration. We aren’t here to judge; we’re here to help you feel healthier and happier. Gum bleaching can be very effective in treating this discoloration but for best long-term results its recommended that you significantly reduce or eliminate smoking or chewing tobacco from your lifestyle. Ethnicity: Some of the most common cases we see at Dental Partners of Boston is gum depigmentation in people of darker skin color. High concentrations of melanin in the skin and soft tissues can cause your gums to look dark or discolored or like you may not care for them well enough. Gum bleaching is a simple yet gentle and highly effective procedure. It is possible to remove or even out coloration in a single visit! If you think you might benefit from this cosmetic procedure, we would love to talk to you to see how we can add a little confidence to your smile! Call us to schedule an appointment or to have any of your questions or concerns addressed. We look forward to hearing from you! Cosmetic dentistry is so much more than appearance. Although it does feel wonderful to have a beautiful smile. 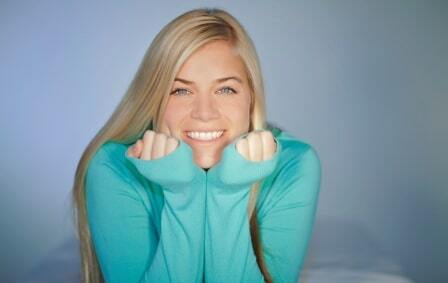 Having a cosmetic dental procedure can offer extraordinary restorative benefits. Our cosmetic dentists in Boston truly value each and everyone of our patients and are always looking to help others achieve the life changing smile that they’ve always wanted. Our dental partners offer complete smile makeovers which is an in-depth process using a variety of cosmetic dentistry procedures to ensure you get the smile you truly want. It can include tooth whitening, crowns or veneers, invisible braces, dental implants, bridges or dentures. If you are looking to get several procedures done a complete smile makeover is for you! 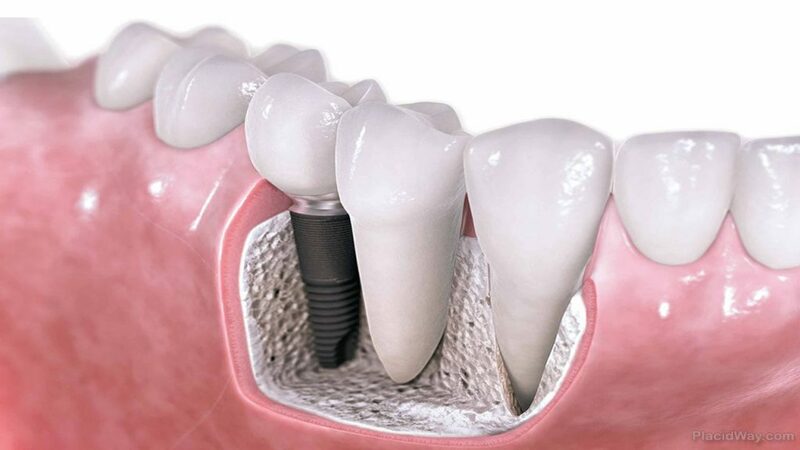 Dental implants are extremely helpful for individuals who have suffered tooth loss. No matter the number of teeth you have lost dental implants allow us to restore your smile to full functionality. These are total tooth replacements and we have great success rates which makes them our top choice to rebuild your smile. Certain foods and beverages can cause our teeth to stain and become discolored such as coffee, tea and wine. Smoking can also cause this. 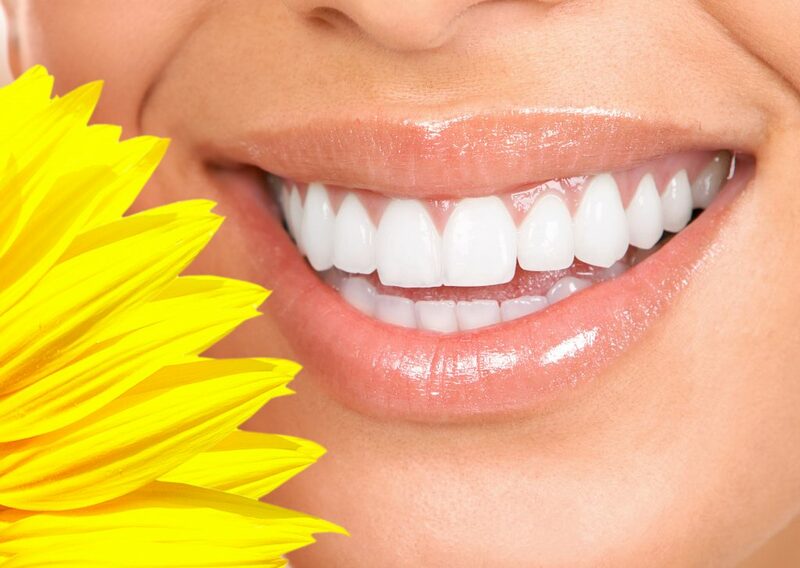 Brightening your smile with us is easy! At Dental Partners of Boston we offer our patients both take-home and in-office teeth whitening services. It will improve your smile and help you to feel confident. We offer many other cosmetic dentistry procedures such as dental veneers, Invisalign, Lumineers, tooth colored fillings, porcelain dental crowns, Botox and Dermal Fillers, dental bonding, and cerec single visit crowns. For a full list and description of our services visit our services page. At Dental Partners of Boston we take cosmetic dentistry very seriously. We understand that cosmetic dentistry is more than just how it looks on the outside. It’s about how your smile makes you feel on the inside. We pride ourselves in our service and experience and look forward to helping you achieve the smile you’ve always dreamed of. Contact us today! Lasers have been around for decades. They’re relatively commonplace and most of us use them or their applications on a daily basis, often without realizing it. Within the medical industry, lasers have become, quite literally, cutting-edge technology. They have advanced the way we operate and heal. At Dental Partners of Boston, we are continually striving to stay at the forefront of technology concerning tools and procedures. We want your experience to be exceptional, and lasers offer a new and in many cases improved method of treating gum disease. Laser gum treatment in Boston has improved the way our dentists care for your gums by taking advantage of the unique properties LANAP has to offer. Through thin fiber optic channels, powerful light is applied to delicately and precisely remove diseased tissue, sterilize open wounds and seal off small bleeds. The accuracy of laser gum treatment significantly improves our patients experience in our office and enables a fast recovery. It has been standard practice for some time now to do regular dental cleanings roughly every six months. During these visits, more traditional tools are used to scrape and blast away sticky plaque and tartar on the teeth or below the gum-line. For many of our patients, this is generally sufficient for controlling tartar buildups. However, some patients have unique situations and or predispositions that contribute to added complications. Thankfully for those patients, laser gum treatment offers a way to get below the gums and remove the infected tissue. Prompt treatment is essential for ensuring the long-term health of your gums and teeth and also prevents the infection from spreading or recurring. One of the more exciting aspects of laser gum treatment is that the specific wavelength of the lasers used by Periodontists, passes through healthy tissue, simultaneously eliminating contacted diseased or infected tissue. The science behind the technology isn’t as easy as the procedure itself but in simple terms, the color of light used in the laser reacts differently with the color of healthy tissue than it does with the tissue needing to be removed. Thanks to the unique properties of periodontal laser gum treatment, no general anesthetic is needed, as is sometimes required for other dental procedures. This less invasive treatment leads to minor discomfort resulting in shorter recovery periods. Even with all the benefits lasers offer, it’s important to remember that it is still vital to prioritize dental care at home. 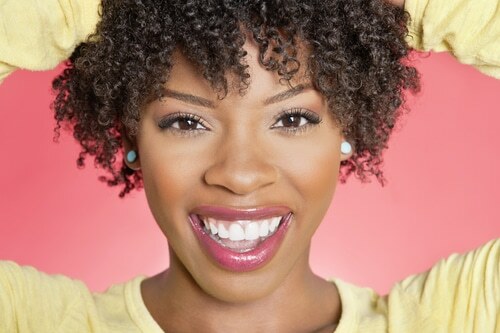 Effective treatment of gum disease starts with daily and consistent brushing and flossing. If you have any concerns about LANAP, or any other dental service we provide, our friendly staff would love to speak with you and help answer your questions. Schedule an appointment today! We look forward to hearing from you and seeing a happier smile on your face! TMJ and TMD are often used interchangeably, but they are not exactly the same thing. TMJ (temporomandibular joint) is the actual joint part of the jaw just in front of the ears, but TMD (temporomandibular disorder) is the discomfort caused by malfunctions of the TMJ. Some of the symptoms can include pain and muscle soreness, clicking or popping sounds when the jaw opens and closes, muscle spasms, headaches, and cracking noises. These can cause a lot of discomfort, as well as more serious consequences down the road, so having your Boston dentist take a look now will prevent some damage in the future. Let’s consider some options with TMJ appliance therapy. Sometimes, when a dentist detects problems with the TMJ, or there is excessive teeth grinding or clenching, TMD may be the prognosis and various treatments can be applied, including a TMJ appliance. An appliance can help by relieving some of the pressure on the joints or by realigning the bite so that symptoms are reduced. A standard appliance acts like a splint to stabilize the joint. They are sometimes called bite guards or plates and can be worn all day or just at night; this will be prescribed by your dentist. When wearing the appliance, the teeth are help in their most correct position and cannot come completely together, preventing the grinding or clenching that often leads to headaches and popping. If you’re looking for a TMJ Appliance in Boston, look no further that our office! Many benefits come from wearing a TMJ appliance, including reduced pain, less pressure, and more relaxed jaw muscles. When teeth are no longer able to be pressed together, less damage will be assessed and fewer problems will occur down the road. Appliances are always removable, so eating and oral hygiene should take place as usual. Just make sure that you are brushing and flossing to avoid other oral problems! If TMJ is interfering in your daily activities, like eating and drinking, laughing or speaking, and you are looking for TMJ treatment in Boston, then schedule an appointment today to come visit with one of our experts to have your questions answered. We’d love to talk to you about your options. When you think about healthy gums, be sure and consider the gum line and how to use the proper techniques to keep it from receding. However, when gums recede or when gum disease takes hold, your Boston Periodontist, Dr. Guzman, is an expert with The Pinhole Surgical Technique and can help restore a healthy gum line to your smile. Let’s answer a few questions to help you decide if the pinhole technique is right for you. Let’s learn from Dr. John Chao who invented this procedure and taught it to Dr. Gusman. The pinhole surgical technique was developed to help restore gum lines by rearranging the existing gum tissue through a hole the size of a pin. A tiny instrument is used to push healthy and newer gum tissue down toward the teeth. Is Gum Recession That Serious? If your gums recede too far, the sensitive part of the tooth begins to be exposed. This leads to discomfort at first, but also can lead to tooth decay or gum decay. The risk of much more serious problems along your gum line and the roots of your teeth increases significantly! A very small needle is used to make a tiny hole in the gums near the damage. Special instruments are then used to loosen some of the surrounding tissue, rearranging it to cover some exposed areas of the tooth. What makes this technique so appealing and effective is its lack of being as invasive as traditional gum grafting. No incisions and no sutures are needed! With no open wounds, discomfort and recovery are minimal, but each patient is different and directions from your dentist should be followed. The time it takes for the procedure itself depends on the number of places that need the technique, but generally it takes between one and two hours for a procedure. Recovery time will be determined by Dr. Guzman, but is usually minimal. As far as the effects of the procedure, it should last as long as it is well taken care of. With good oral hygiene, the results can last many years! Will This Cure My Gum Disease? No, but it can give you a healthier gum line. The gum disease must be treated beforehand. 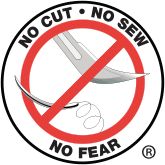 There is no more risk with The Pinhole Surgical Technique than any other simple dental procedure. Schedule an appointment online or call us today to learn more about the pinhole surgical technique. Our goal is to help you get back that healthy smile you’re meant to have!